All weekly employees will be entitled to a day off, without deduction of pay, where the employee would ordinarily be rostered to work one of the following public holidays and does not work on that public holiday: Monday, 25 December 2017, Tuesday, 26 December 2017, Monday, 1 January 2018 and Friday, 26 January 2018. Part-time employees will receive a pro-rata entitlement of non-rostered public holidays based on hours worked including ordinary and flexed-up hours. 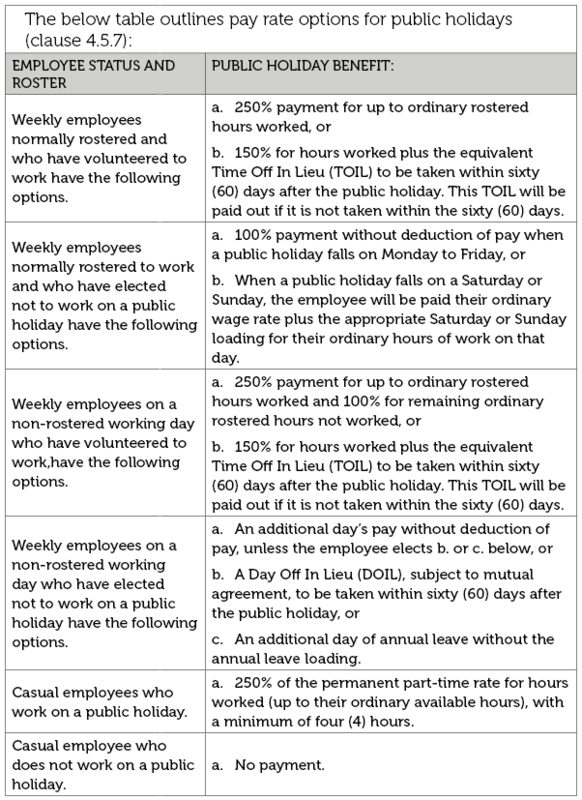 (a) All Shifts for work on a Public Holiday would be planned around the ordinary working hours of the permanent employee. (b) For all employees, if an 8 hour shift is offered by the manager and accepted by the employee, 8 hours pay will be paid. (c) All employees can by mutual agreement, negotiate shorter hours of work. Employees who work on a public holiday will be paid for a minimum period of 4 hours. Employees will not be required to work any longer than the period originally agreed to work, however may agree to work longer by mutual agreement. Meal Breaks – Afternoon and Night Shift Workers working on a public holiday remain entitled to their paid meal breaks. (a) An employee whose ordinary week commences on the night prior to a Monday public holiday may regard this shift as their Public Holiday, and will instead work their ordinary hours on the shift commencing on the night of the Public Holiday. (b) An employee whose ordinary week commences on the night of a Monday public holiday, if mutually agreed to, may regard this shift as their Public Holiday. (c) For all public holidays which fall on a day other than Monday, the public holiday for nightshift will be the night commencing prior and leading into the public holiday. The employee may elect three (3) alternate dates of which the company is required to accept one of these as the agreed date which is to be taken within 60 days (the day in lieu will paid at the ordinary wage rate plus applicable shift allowances). For night shift only – In the case of a Public Holiday falling on a Monday, employees whose ordinary hours include work on a Sunday, will by mutual agreement or by a recommendation of a majority of employees on the shift, not work on the Sunday immediately prior to the Monday Public Holiday and will instead work their ordinary hours on the Monday Public Holiday. Payment for the Sunday not worked will be at the ordinary time rate (i.e. not at the loaded rates detailed in Clause 2.10) and payment for all time worked on the Monday Public Holiday shall be made at a total of double time and a half. 8. Casual Employees – If a casual employee is required to work on a public holiday they will be paid the Part Time hourly rate in lieu of the Casual Hourly rate of pay. Casual employees will not be paid the 25% Casual Loading when working on a public holiday because of the other provisions of this clause. Non rotating afternoon shift hourly allowance $5.00. Non rotating night shift hourly allowance $6.54.